Why place Remembrance Ad in Samaja Newspaper ? Remembrance ads are published in accordance with the death anniversary of an individual. 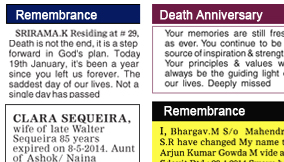 To commemorate the accomplishments and achievements of the departed, and to honour and cherish their memory, these ads are published in local newspapers, along with the date of birth and the date of passing of the deceased. Book your ads online in a simple 3 step process. •Avail the lowest ad rates and best deals without having to pay any overhead charges. Track the progress of your ad until it is ready for publication. Benefit from a wide variety of choices when it comes to payment options with numerous online & offline options. • It was a cold winter morning ten years ago when you left us. We miss your joyful presence. Your spirited soul and smile will live with us forever. In loving memory of our Ma. Joy and Marie. How To Book Remembrance Ad in Samaja Newspaper ? Compose your ad and remember to upload any photographs you might want to use. Clear payment via a host of online and offline methods after choosing advertising dates. To book your ads immediately, follow the steps mentioned above. 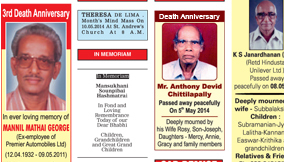 If you wish to know more about Samaja Remembrance ads, take a look at the tabs above.